Oprah Winfrey, the first black woman to win the Cecil B. DeMille Award, spent most of her speech time at the 75th Golden Globes talking about the long fight for women's justice. Only a few minutes into Sunday night's Golden Globes red-carpet broadcast on E!, Debra Messing explained to host Giuliana Rancic why nearly all the women were wearing black. (The men were, too, but they always do that.) Messing explained that it was part of the Time's Up initiative, which supports women who suffer from sexual harassment and assault — and not just in Hollywood. She went on to call out the recent departure from E! News of host Catt Sadler, who says she left after discovering she was making nowhere near the money her male co-host was making. Other actresses followed Messing's lead, repeatedly dunking on the very network hosting the broadcast, turning its ubiquity on awards day against it. That's a peculiar power, but they had it, and they used it well. Awards shows can make famous people seem obsequious and grasping. It was unusual to see one that often found them using their time on stage to make demands, or to be angry, or simply to have the conversations they chose to have. The red-carpet activism went beyond black dresses. Actresses brought up the money the Time's Up initiative has raised. They talked about the importance of standards for the representation of women of color particularly — and they did it using the word "intersectionality." Perhaps most significantly, a number of actresses walked the red carpet accompanied by experienced activists who work on behalf of women outside the entertainment industry. Michelle Williams was joined, for instance, by Tarana Burke, who began using the phrase "Me Too" years ago in her advocacy for women of color who'd been sexually abused. And E!, which normally inquires about dresses and asks women to pose for photos of their shoes and nails, broadcast interview after interview in which these activists were introduced and their organizations named. When the show started, the focus stayed where it was, as host Seth Meyers made harassment the focus of most of his monologue, including a brutal and direct Harvey Weinstein joke. Weinstein — a longtime awards fixture and, many groused, fixer — wasn't present, Meyers said, but he'd be back in 20 years as "the first person ever booed at the In Memoriam." Meyers further poked at Kevin Spacey and Woody Allen by name. Some of the work that was honored by the Hollywood Foreign Press Association fit this theme of women supporting each other (or not), too: Lady Bird was the best comedy or musical film, and Saoirse Ronan won for her performance as the lead character, who struggles with her relationship with her mother. Allison Janney won for playing Tonya Harding's mother in I, Tonya. The Handmaid's Tale won for television drama and for Elisabeth Moss' performance, and Big Little Lies won best TV miniseries or movie and snagged awards for Nicole Kidman and Laura Dern; both shows are deeply concerned with abuse and the topic of women's anger. Dern gave one of the most specific speeches of the night addressing the Time's Up agenda, reminding her colleagues of the concept of restorative justice — saying that it's important to support and employ those who have reported abuse and harassment. Three Billboards Outside Ebbing, Missouri, which labors to manufacture a version of mid-American authenticity and to say something about anger, apparently persuaded the HFPA, which gave awards to Frances McDormand, Sam Rockwell and the screenplay by Martin McDonagh. The film closed the night by winning Best Motion Picture — Drama. Just as much of the night reflected the wide concerns people are feeling around abuse, it also reflected limitations that are often found in the responses to it. As is so often the case, the women being heard were mostly white, and many of the off-screen creators of the pieces they'd worked on are men. 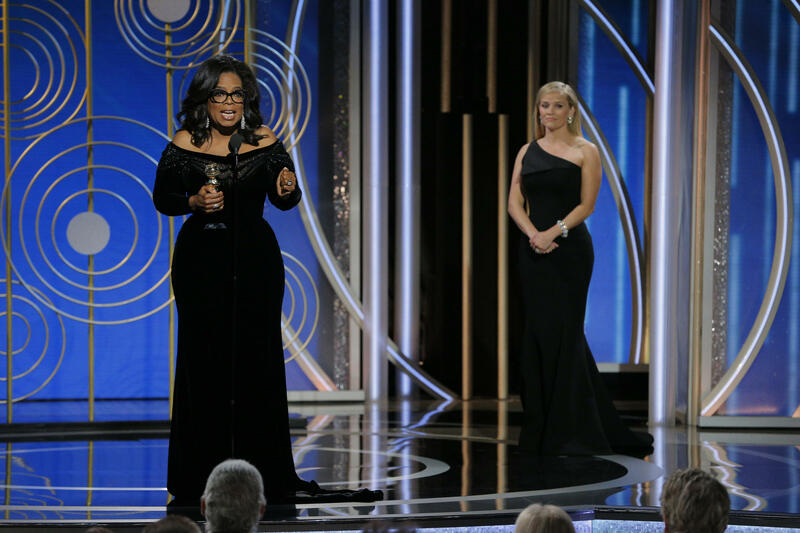 But just as the evening began to lose the focus the red carpet had brought, Oprah Winfrey became the first black woman to win the Cecil B. DeMille Award, and she spent nearly all her time talking about the long struggle for justice for women. She said "time's up," she said "me too," and she promised hope. Hope, even while she told the story of Recy Taylor, who was raped in 1944 and later aided by NAACP activist Rosa Parks. Winfrey's speech — which did, at times, sound almost campaign-like — provided the ceremony's emotional pivot point. It seemed to rile up Natalie Portman, who came out with Ron Howard to present the award for Best Director and pointedly introduced the "all-male nominees." (The winner was Guillermo del Toro for The Shape Of Water.) Much later, as Barbra Streisand prepared to present the night's final award, she pointed out that she was the only woman director to ever win the Golden Globe, and that she'd won in 1984. There were other moments, unrelated to this through line: Tommy Wiseau, the eccentric (probably an understatement) writer-director of the awful (probably an understatement) 2003 film The Room, joined James Franco on stage as Franco accepted the award for outstanding lead actor in a comedy or musical for playing Wiseau in The Disaster Artist. Coco, Pixar's lovely film about a Mexican family on Dia de los Muertos, won for best animated film. In the Fade, starring Diane Kruger as a woman coping with tragedy, won for best foreign-language film. And there were plenty of men honored, of course: Sterling K. Brown won for This Is Us. Ewan McGregor won for the third season of FX's Fargo. Gary Oldman won for his dramatic role in The Darkest Hour. Streaming services had a good night on the television side. In addition to Hulu's success with The Handmaid's Tale, the HFPA, it turns out, is just as fond of Amazon's The Marvelous Mrs. Maisel as it was of Amazon's Mozart in the Jungle (which won best comedy series in 2016). It named the show best comedy series and its star, Rachel Brosnahan, the best comedy actress. Netflix got in on the act with Master of None, for which Aziz Ansari won best actor in a comedy. But these awards, and this presentation of them, reflected how awards work in general. They're weirdly powerful, people pay attention against what is sometimes their better judgment, and if you can seize the moment in which the spotlight settles on you, you might get something done. But do it fast, because memories are short.